PVI conducted a 3-day cementing engineering software training for clients in Houston from Oct. 3 to Oct. 5, 2018. PVI exhibited at the ATCE at Kay Bailey Hutchison Convention Center, Dalls, Texas from Sept. 24, 2018 to Sept. 26, 2018. 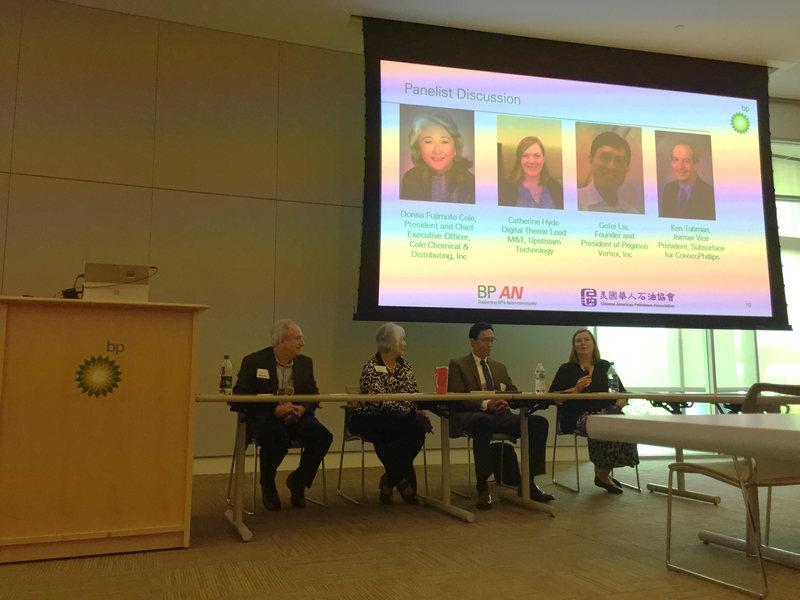 On Aug. 18th, 2018, Gefei Liu, president of PVI, participated in the 2018 Career Development Forum in Houston, organized by BP Asian Network (BPAN) and CAPA. This annual event since 2008 brought a panel with diverse background and experience in identifying opportunities in digitization revolution. This is part of the BPAN’s and CAPA’s efforts to reach out to professionals and students. Click here to read some of the tips Gefei Liu gave on how to overcome challenges and seek for opportunities in the digitalization revolution. PVI exhibited at the Global Petroleum Show at Stampede Park in Calgary, Cananda from Jun. 12, 2018 to Jun. 14, 2018. 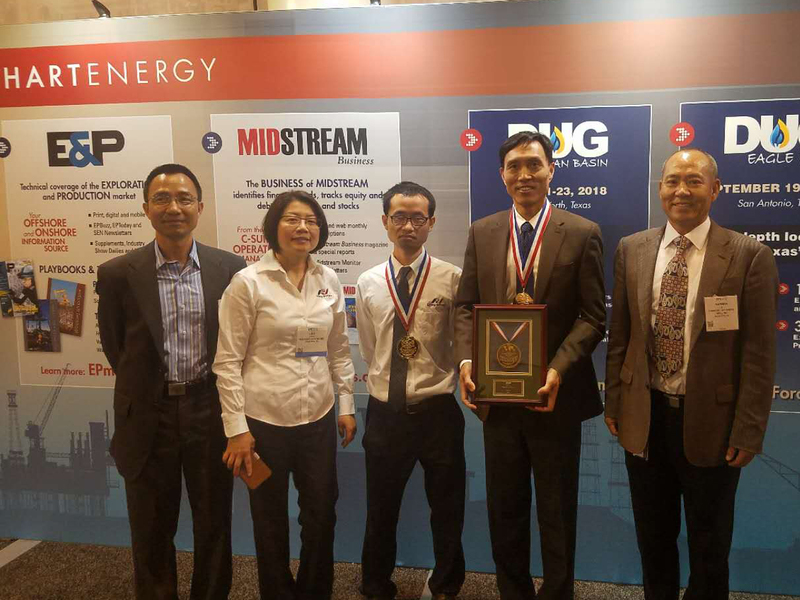 PVI was awarded by Hart Energy as the MEA winner in Drilling Fluids/Stimulation discipline, with the winning software being CEMPRO+. 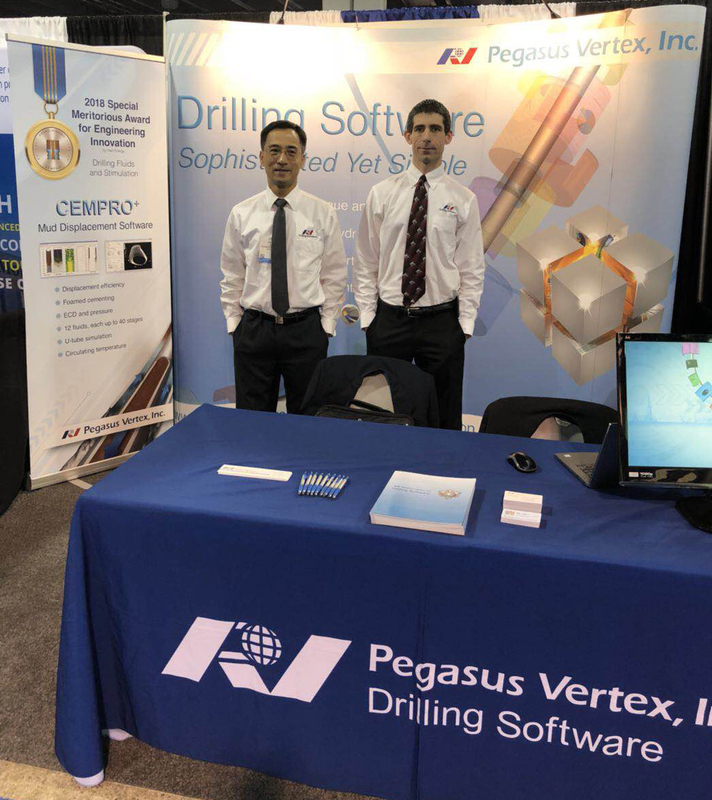 PVI exhibited at the Offshore Technology Conference at NRG Arena in Houston, Texas from Apr. 30, 2018 to May 4, 2018. PVI conducted a 3-day cementing engineering software training for clients in Houston from Feb. 14 to Feb. 16, 2018. PVI exhibited at the ADIPEC at Abu Dhabi US Pavilion in United Arab Emirates from Nov. 13 to 16, 2017. PVI also conducted a 1-day Cementing Engineering Software training course on November 12, 2017. PVI conducted a 2-day torque and drag software training for clients in Houston from Nov. 1 to Nov. 2, 2017. We also presented SPE 187151 on circulating subs and their impact on downhole hydraulics during this class. PVI conducted a 3-day cemeneting engineering software training for clients in Houston, Sept. 27 - 29, 2017. PVI conducted a mud reporting software (MUDPRO) training for clients in Houston, Aug. 14, 2017. PVI conducted a 3-day cementing engineering software training for clients in Houston, Aug. 7 - 9, 2017. PVI exhibited at the 2017 Offshore Technology Conference at NRG Park, Houston, Texas, USA, May 1 - 4, 2017. PVI conducted a 3-day wellbore cementing software training for clients in Houston, Mar. 15 - 17, 2017. PVI gathered at the Oil Ranch, Hockley, Texas on Nov. 19, 2016 for annual company retreat. PVI conducted a 4-day wellbore cementing software training for National Petroleum Services (NPS) in Bahrain, Sept. 25 - 28, 2016. PVI exhibited at the 2016 Annual Technical Conference and Exhibition at the Dubai World Trade Centre, Dubai, UAE, Sept. 26 - 28, 2016. PVI conducted a 1-day wellbore cleanup software training for Tetra, Aug. 4, 2016. PVI exhibited at the 2016 Global Petroleum Show at Stampede Park, Calgary, Alberta, Canada, Jun. 7 - 9, 2016. PVI exhibited at the 2016 OTC at NRG Park, Houston, TX, USA, May 2 - 5, 2016. PVI exhibited at the 2016 SPE/IADC Drilling Conference and Exhibition at the Fort Worth Convention Center in Fort Worth, TX, Mar. 1 - 3, 2016. PVI attended the SPE International Conference and Exhibition on Formation Damage Control at the Lafayette Hilton in Lafayette, Louisiana, Feb. 24 - 25, 2016. PVI exhibited at the 2016 SPE/IADC Middle East Drilling Technology Conference and Exhibition at the Jumeirah at Ethihad Towers in Abu Dhabi, UAE, Jan. 26 - 28, 2016. PVI exhibited at the 2015 CING technology and equipment exhibition at the Chengdu Century City New International Convention and Exhibition Center in Sichuan Province, China, Nov. 4 - 6, 2015. PVI exhibited at the 2015 DUG Eagle Ford conference and exhibition at the Henry B. Gonzalez Convention Center in San Antonio, TX, USA, Oct. 25 - 27, 2015. PVI successfully conducted cementing software luncheons during Oct. 6th, 13th, and 20th, 2015. On Oct. 16 - 18, 2015, PVI gathered at the Artesian Lakes, Texas for annual company retreat. PVI exhibited at the 2015 SPE - Annual Technical Conference & Exhibition at the George R. Brown Convention Center in Houston, TX, USA, Sept. 28 - 30, 2015. PVI successfully conducted mud reporting software luncheons during Aug. 25th, Sept. 1st and September 8th, 2015. PVI exhibited at the 2015 IADC World Drilling Conference & exhibition at the Rome Cavalieri Waldorf Astoria Hotel in Rome, Italy, Jun. 17 - 18, 2015. PVI exhibited at the 2015 Global Petroleum Show at the Stampade Park in Calgary, Alberta, Canada, Jun. 9 - 11, 2015. 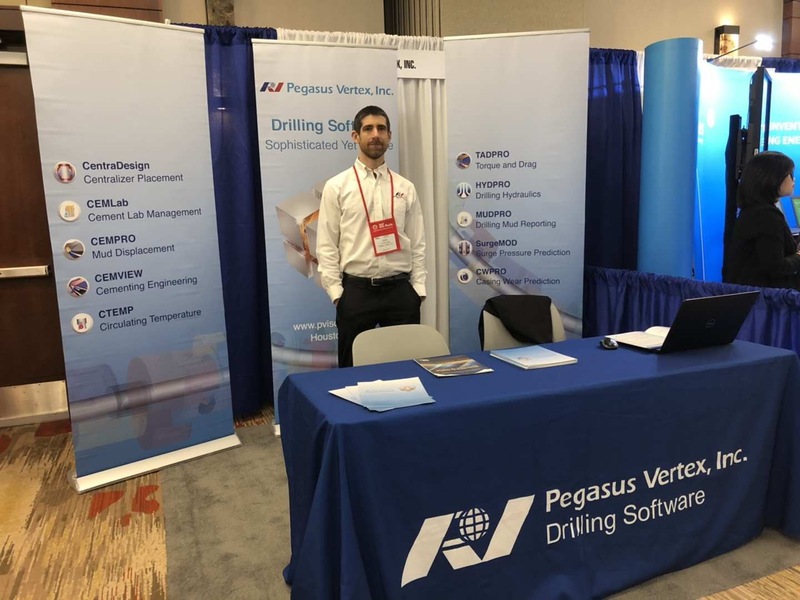 PVI exhibited at the 2015 IADC Drilling Onshore Conference & Exhibition at the Omni Hotel Houston Westside in Houston, Texas, USA, May 14, 2015. PVI exhibited at the OTC at the NRG Park in Houston, Texas, USA, May. 4 - 7, 2015. PVI exhibited at the 2015 IADC/SPE Managed Pressure and Underbalanced Operations Conference & Exhibition at the Marma Hotel in Dubai, UAE, Apr. 13 - 14, 2015. On April 9th, 2015, PVI participated SPE-GCS’s Technical Writing Workshop, conducted by Byron Haynes Jr. from Shell Global Solutions. This 3-hr workshop taught individuals how to take complex ideas and make them understandable and memorable in written form for documentation and presentation. PVI exhibited at the 2015 AADE at the San Antonio Convention & Visitors Bureau, Apr. 8 - 9, 2015. PVI exhibited at the CIPPE at the New China Exhibition Center, Beijing, China, Mar. 26 - 28, 2015. PVI exhibited at the SPE/IADC Drilling Conference and Exhibition at the ExCel London in London, United Kingdom, Mar. 17 - 19, 2015. PVI exhibited at the API - Exploration and Production Winter Standards Meeting at the InterContinental New Orleans Hotel, New Orleans, Louisiana, USA, Jan. 26 - 30, 2015. PVI exhibited at the 2nd Global Well Cem Conference on Well Cements: Production and Performance in The Woodlands Resort, TX, USA, Jan. 22 - 23, 2015. 8th International Petroleum Technology Conference (IPTC) - Kuala Lumpur, Malaysia. PVI exhibited at the 8th International Petroleum Technology Conference (IPTC) in Kuala Lumpur Convention Centre, Kuala Lumpur, Malaysia, Dec. 6 - 9, 2014. 2014 PVI Annual Company Retreat - Texas, USA. PVI’s annual company retreat took place at Medina Highpoint Resort in Medina, Texas. The PVI team partook in team-building activities, hiking, enjoyed breathtaking views and delicious food. It was a memorable experience as the PVI family celebrated its rapid growth throughout the years. SPE Annual Technical Conference & Exhibition - Amsterdam, Netherlands. PVI exhibited at the 2014 SPE Annual Technical Conference & Exhibition (ATCE) on October 27-29, 2014 at the RAI Center in Amsterdam, Netherlands. PVI Cementing Software Training - Neuquén, Argentina. PVI successfully conducted a 2-day cementing software training for CalFrac in Neuquén, Argentina. IADC Drilling Africa 2014 Conference & Exhibition - Paris, France. PVI attended the IADC Drilling Africa 2014 Conference & Exhibition in Le Meridien Etoile Hotel, 81 Boulevard Gouvion-Saint-Cyr in Paris, France. Deepwater Drilling and Completions Conference - Galveston, Texas. PVI exhibited at the 2014 Deepwater Drilling and Completions Conference on September 10 - 11, 2014 at the Moody Gardens Hotel & Convention Center, Galveston, Texas. 10th IADC/SPE Asia Pacific Drilling Technology Conference - Bangkok, Thailand. PVI exhibited at the 10th IADC/SPE Asia Pacific Drilling Technology Conference on August 25 - 27, 2014 at Bangkok Convention Centre at Central World, Bangkok, Thailand. IADC World Drilling Conference and Exhibition - Vienna, Austria. PVI attended the IADC World Drilling 2014 Conference and Exhibition on June 18 - 19, 2014 at the Bruno Kreisky Platz 1, Vienna, Austria. Global Petroleum Show - Calgary, Alberta, Canada. PVI exhibited at the 2014 Global Petroleum Show on June 10 - 12, 2014 at the Stampede Park in Calgary, Alberta, Canada. PVI MUDPRO Software Training - Khobar, Saudi Arabia. PVI successfully conducted a 2-day MUDPRO software training for OES in Khobar, Saudi Arabia. Second Annual Oil and Gas Golf Tournament - Houston, Texas, USA. PVI hosted the Second Annual Oil and Gas Golf Tournament benefiting the Houston Food Bank. The event was held at the Augusta Pines Golf Club making it an excellent opportunity to support a great cause while networking with old colleagues and meeting new friends. OTC Offshore Technology Conference - Houston, Texas, USA. PVI exhibited at the 2014 OTC - Offshore Technology Conference on May 5 - 8, 2014 at the Reliant Park in Houston, Texas, USA. 2014 AADE National Fluids Technical Conference & Exhibition - Houston, Texas, USA. PVI exhibited at the 2014 National Fluids Technical Conference & Exhibition on April 15 - 16, 2014 at the Hilton Houston North in Houston, Texas. 4th Colombia Oil & Gas Summit and Exhibition - Cartagena, Colombia. PVI exhibited at the 4th Colombia Oil & Gas Summit and Exhibition on April 2 - 4, 2014 at the El Centro de Convenciones y Exposiciones Cartagena de Indias Julio Cesar Turbay Ayala in Cartagena, Colombia. PVI Cementing Software Training - Port-of-Spain, Trinidad, W.I. PVI successfully conducted a 2-day cementing software (CEMPRO+ and CentraDesign) school for Tucker Energy Services, Trinidad. IADC/SPE Drilling Conference and Exhibition - Fort Worth, Teas, USA. PVI exhibited at the 2014 IADC/SPE Drilling Conference and Exhibition on March 4 - 6, 2014 at the Fort Worth Convention Center in Fort Worth, Texas. SPE International Symposium and Exhibition - Lafayette, Louisiana, USA. PVI exhibited at the SPE International Symposium and Exhibition on Formation Damage Control on February 26 - 28, 2014, at the Lafayette Hilton in Lafayette, Louisiana. 1st Global WellCem Conference and Exhibition - Dubai, UAE. PVI participated in Global WellCem Conference and Exhibition on January 13 - 14, 2014, at Dubai, UAE. Lake Tahoe Company Retreat - California, USA. Mark Twain said that best: "At last the lake burst upon us". The PVI team shared a memorable thanksgiving together beside this exquisite gem created by mother nature. We were surrounded by pines and The overwhelming feeling of the peace and relax. Everyone greatly enjoyed this thanksgiving. Artesian Lakes Company Retreat - Texas, USA. On October 18 - 20, Our company retreat was hosted at Artesian Lakes, Texas. The PVI team gathered together to enjoy the beautiful weather, and to celebrate PVI's growth while meeting old and new friends. PVI TADPRO Software Training - Lafayette, Louisiana, USA. PVI successfully conducted a 2-day torque and drag software course for Frank's International in Lafayette, Louisiana. SPE/IADC Middle East Drilling Technology Conference & Exhibition - Dubai, UAE. PVI exhibited at the 2013 SPE/IADC Middle East Drilling Technology Conference and Exhibition on October 7 - 9, 2013, at Dubai, UAE. ATCE - SPE Annual Technical Conference & Exhibition - New Orleans, Louisiana. PVI exhibited at the 2013 SPE Annual Technical Conference & Exhibition on September 30 - October 2, 2013, at the Ernest N. Morial Convention Center in New Orleans, Louisiana, USA. On September 25th, 2013, Mr. Angus A. McColl, Executive Director, Corporate & Foundation Relations, University of Southern California, visited PVI. PVI has donated multiple seats of its advanced drilling software, worth of $2,000,000, as gift-in-kind to the USC Viterbi School of Engineering, to provide the students with experience using the latest drilling technology. PVI successfully conducted a 4-day cementing software school for a fast-growing service company in Erbil. PVI exhibited at the 2013 Brazil Offshore | Oil & Gas Exhibition and Conference on June 11 - 14, 2013 at the Macaé Centro in Macaé, Rio de Janeiro, Brazil. PVI exhibited at the 2013 OTC - Offshore Technology Conference at the Reliant Park in Houston, Texas, USA. 1st Annual Oil & Gas Charity Golf Tournament- Pine Crest Golf Club - Houston, Texas, USA. PVI successfully hosted an oil and gas charity golf tournament. We raised $2,000 and collected non-perishable food items for the Houston Food Bank. Many thanks to our generous sponsors and supporters. 2013 Houston Oilman's Tennis Tournament (HOTT) - Spring, Texas, USA. The 2013 Houston Oilman's Tennis Tournament, held at the Giammalva Racquet Club, Nathan Lu (Diamond Offshore) and Gefei Liu (PVI) won 1st place in Tournament Doubles (Group A - Consolation). SPE/IADC Drilling Conference & Exhibition - Amsterdam, The Netherlands. PVI exhibited at the 2013 SPE/IADC Drilling Conference and Exhibition on March 5 - 7, 2013 at the Rai Congress Centre in Amsterdam, The Netherlands. PVI Cementing Software Training - Dubai, UAE. PVI successfully conducted a 5-day cementing software school for Weatherford in Dubai. 17 cementing engineers/managers from 8 countries from the Middle East, North Africa (MENA) and Russia attended this intensive course. This is also the 3rd time in one year that PVI provided similar training to our clients in MENA. One-day TADPRO (torque and drag) Training - Calgary, Canada. PVI provided an intensive one-day TADPRO training to drilling engineers and well planners in Phoenix Technology Services in Calgary. Drilling Hydraulics Software Training - Santa Cruz, Bolivia. PVI successfully conducted a drilling hydraulics software training in Santa Cruz on January 16 and 17, 2013 for NOV in Bolivia. On November 30 - December 2, 2012, the PVI team went to Artesian Lakes located at Cleveland, Texas. This annual company retreat was a great getaway for our team to explore nature, relax our minds, and escape from the hustle and bustle in the city. PVI exhibited at the 2012 SPE Annual Technical Conference & Exhibition on October 8 - 10, 2012 at the Henry B. Gonzalez Convention Center in San Antonio, Texas, USA. PVI exhibited at the 2012 South Texas Oilfield Expo on September 19 - 20, 2012 at the American Bank Center in Corpus Christi, Texas, USA. On August 23rd, 2012, a delegate from China University of Petroleum, Qingdao, China, visited PVI. The meeting went well with both parties expressing interests in research and development corporation in the future. PVI successfully conducted a cementing software training course in Dubai in July 2012 for Mayssan Oil Company (MOC) in Iraq. The course covered the hydraulics involved in mud displacement, software operation, exercises and case studies. During training, the end users learned how to utilize "Best of Breed" technology to make the most effective decisions before cementing the wellbore. Both instructor and trainees shared a good time inside and outside of the training room. We appreciate ALMCO Group's effort to arrange this training. PVI exhibited at the 2012 Global Petroleum Show on June 12 - 14, 2012 at Stampede Park, Calgary, Alberta, Canada. PVI exhibited at the 2012 AADE Fluids Technical Conference & Exhibition on April 10 - 11, 2012 at Hilton Houston North, Houston, Texas. The 2012 Houston Oilman's Tennis Tournament, held at the Giammalva Racquet Club, Nathan Lu of Diamond Offshore and Gefei Liu of PVI, won 2nd place in the doubles tournament (Group Black - Consolation). Bianca Posada and Gefei Liu won 2nd place in Mixed-Doubles (Group Black). PVI exhibited at the 2012 IADC/SPE Drilling Conference and Exhibition on March 6 - 8, 2012 at Town and Country Resort & Convention Center, San Diego, California. All PVI employees and their families gathered together at Moody Gardens Hotel enjoying the theme parks, traditional festival of lights, and signature cuisine. This annual company retreat provided us with an excellent chance to unwind after the busiest time of the year. Nathan Lu of Diamond Offshore and Gefei Liu of PVI won 1st place of Tournament Doubles (Group A) at the 28th Annual SPE - Gulf Coast Section Tennis Tournament held on Nov. 4 - 5, 2011 at the Houston Racquet Club. 2011 ATCE - SPE Annual Technical Conference and Exhibition on October 30 - November 2, 2011 at Denver, Colorado. PVI successfully conducted a drilling software training for a major drilling fluid company in Villahermosa, Mexico during Oct. 7 - 10, 2011. PVI exhibited at the 2011 SPE Americas Unconventional Gas Conference on June 14 - 16, 2011 at The Woodlands Waterway Marriott Hotel and Convention Center, The Woodlands, Texas. PVI exhibited at the 2011 AADE National Technical Conference & Exhibition on April 12 - 14 at Hilton Houston North, Houston, Texas. PVI participated in the 2011 SPE/IADC Drilling Conference & Exhibition with TIW, March 1 - 3, 2011 at Rai Congress Center, Amsterdam, The Netherlands.